I am sure by now that you have this idyllic little picture in your head, as we do, of life at the cabin. In the summer fishing and taking long hikes. The dogs romping off-lead. Wildflowers everywhere. In the winter you can see us tucked into our cabin sitting in front of a fire while snowflakes drift lazily past the windows. La Vie en Rose for sure! Well, at least for us it is. I can't speak for the rest of you. Let's just take off the rose-colored glasses for a moment, shall we? They are several things that interfere with this life of bliss. The worst offender is The Wind. It deserves capitalization and respect. The Wind is both friend and foe. A friend first because it gives us power through our wind generator (seen here). The wind is a good source of energy for us. It fills up our little battery-powered home quickly. 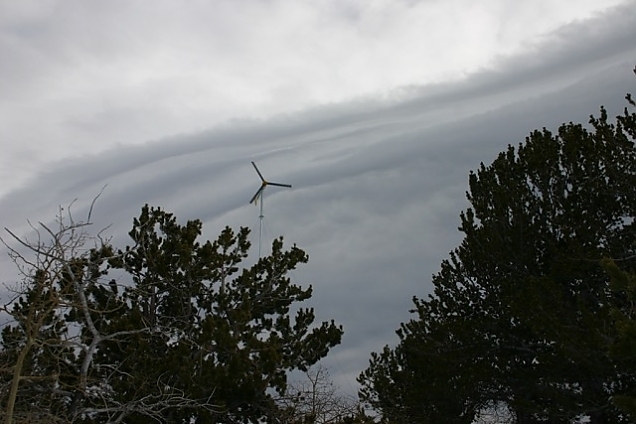 The one big drawback to the wind generator is the furling process. When the wind blows too hard the generator turns its tail to the wind to save itself (called furling), and when it does it makes the most god-awful noise! It sounds like a helicopter just landed on the roof. It can get very annoying to say the least. I suppose when you hear it all the time you will cease to notice after a while. Kind of like parents with screaming children. 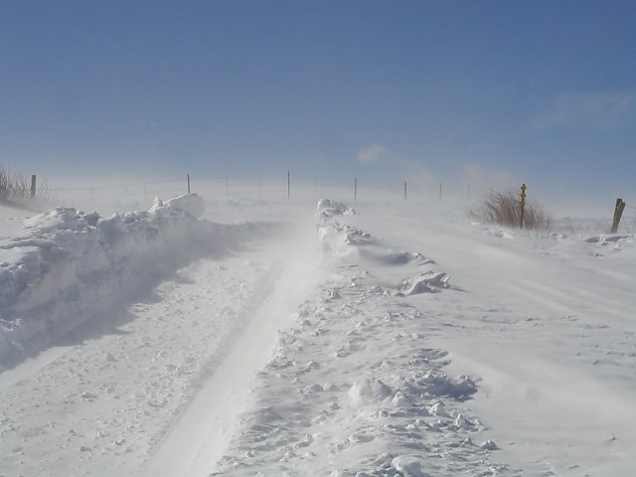 The wind is not our friend when it blows the snow into huge drifts and makes the roads impassable. Up here you can't really go through the drifts, you have to go over them or around them, hence the need for an all-terrain vehicle like the Polaris we are going to buy that has switchable treads; one for snow and one for normal use. The wind is sneaky. You can have a clear blue sky and still get snowed in. How you might ask? Whiteout conditions. 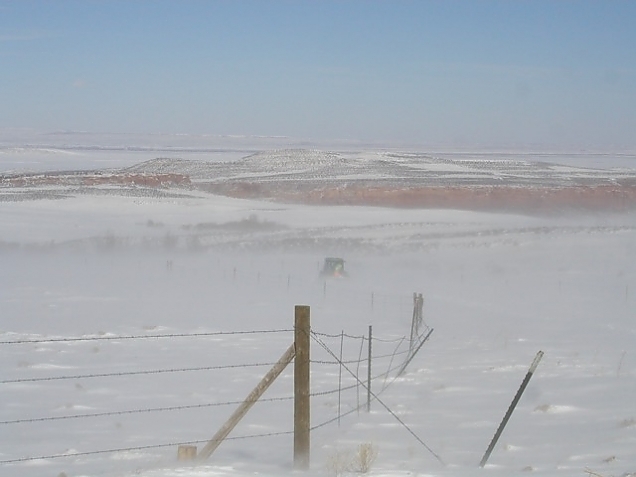 Snow that is on the surface and not packed down is lifted up and carried by the wind. It will fill in any and every crevice (such as your newly plowed driveway) in a matter of a few minutes. We know, we've been stuck in those conditions once. See that greenish blip in the above photo? That's Larry, one of our neighbors, in his big green John Deere snowplow/snowblower making a path for us to follow in. I can tell you that the snow was filling our tracks in behind us as quickly as we left them. Scary. Of course, we needed to get out because Rick needed to be at work and we couldn't wait it out. In the future we will just stay where we are! 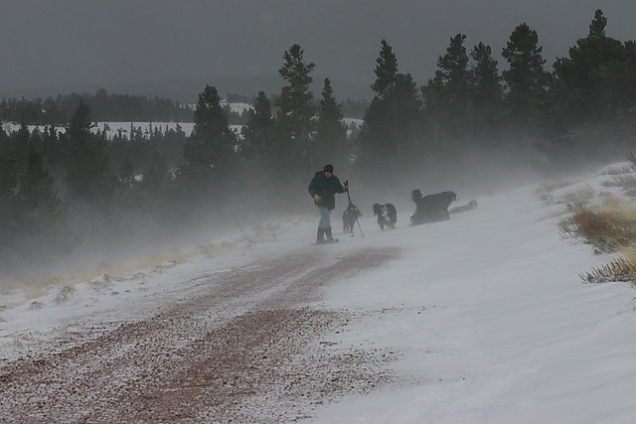 Did I mention that we live seven miles in from a road that is plowed by the state of Wyoming? 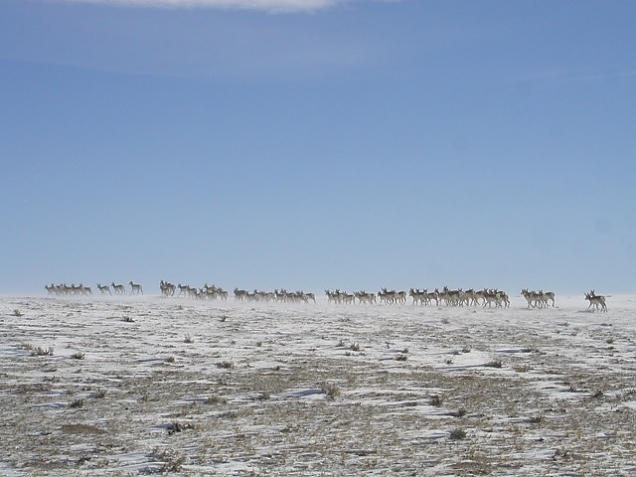 Many people leave their vehicles at the house of a person who lives on the Wyoming side and drive their all-terrain vehicles to his house, then leave it there and take their normal vehicle into town or to get the mail. And yes, there are times when we could be snowed in for weeks at a time. You just have to prepare in advance. 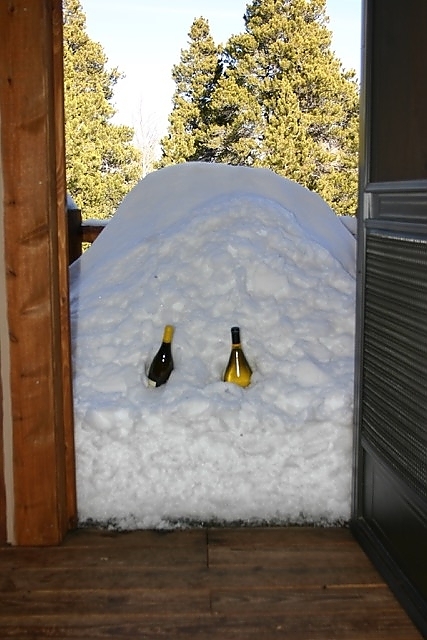 If all else fails at least you have snow as a reliable source of keeping your wine cool.